Olympia Tumwater Foundation Traditional Scholarships 2016 ranging from $5,000 to $10,000 are awarded to Thurston County graduating high school seniors who plan to attend school within the State of Washington. Applicants will be screened for academic promise, 3.0 grade point average or better, work ethic, community involvement, and financial need. Students Should Contact Their High School Scholarship Coordinator For Submission Details.Each school will then forward their recommendations to the Foundation in late April each year. 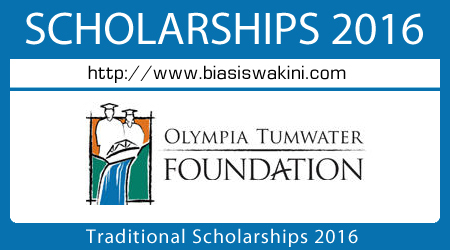 0 Komentar untuk "Olympia Tumwater Foundation Traditional Scholarships 2016"